If you want nothing less than the best hunting device for monitoring of your property, the Browning Strike Force BTC-5 is designed for you. This trail camera comes at a pocket friendly price and makes a great choice for almost any outdoor application. Capture game photos with ease and with impressive clarity with this model engineered with plenty of awesome capabilities. The ideal choice for any outdoor setting, the Browning Strike Force BTC-5 is equipped with invisible infrared LED illumination that provides superbly clear images after dark without spooking the animals away, so they will keep visiting the bait plot you set up for them. The remarkable 55-foot detection range works alongside the 100-foot flash range to ensure that nothing will get by from the ‘watchful’ capabilities of this trail cam. You won’t have to set up the unit too near where the animals pass on the trail so they won’t get scared off and decide to change their travel patterns. 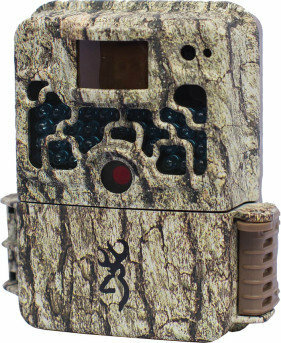 This trail cam offers a lightning-fast 0.67 second trigger speed so it will easily capture images of the game while they are still within the camera frame, so you won’t end up with lousy photos of tails and heads that will make it hard to gauge the size of the game that visits your property. This way, you can plan your hunting activity much easier. Made by a widely recognized brand, this trail camera has durable manufacture to give you years of reliable service down the road. It is capable of supporting 32GB SD cards, ensuring that it always has more than enough memory to store images so you won’t be required to visit it often to check on the remaining storage capacity. Visiting the camera more often than necessary will result in leaving your scent on the hunting site, which will alert the animals of your presence and driving them off in the process. There’s always plenty of memory for videos and photos since this unit is able to take up to 10,000 photos on a set of 6 double-A batteries so you have more than enough images of the area under surveillance. The tremendous 100-foot flash range ensures just enough illumination at a distance and up close, so images come out with greater clarity, depth and differentiation. The infrared flash is activated with movement, so the game will not get spooked and you can get plenty of still images and video in exceptionally high definition thanks also to the 10- megapixel capability of this unit. It can record videos with audio lasting between 5 seconds and 2 minutes long, so you can observe the game in their natural setting and study their vocalizations as well. You save money as well as regular visits to the unit with the long battery life of this trail camera. The awesome camouflage design lets you hide the unit easily among the trees or the surrounding bushes. The compact case size measuring 5 x 4 x 2.5 inches enables problem-free placement and easy portability from one area to another. This model takes up to 8 multi-shot images and up to 6 Rapid Fire images at a time so you always have plenty of photos and footage to study. Your photos always have the information you need so you can make your hunting plans accordingly thanks to the moon phase, time, date and camera ID stamp provided in images. The programmable picture delay ensures that the camera won’t be wasting precious memory storage by taking images only when it has sensed motion, and will start taking footages lasting between 5 seconds and 60 minutes. The unit also provides barometric pressure information for logging and tracking data. The 12-volt external power jack lets you recharge the batteries without having to attach the camera while doing so. The TV out enables you to watch impressive 1280 x 720 high definition videos or captured footage with audio that you can share with the family or with your hunting pals. The included Browning Buck Watch Timelapse viewer software lets you observe an entire day of footage compressed in just a few minutes of video. The ¼- 20 tripod socket allows attachment to a tripod for observation from far off or up close. The USB port allows you to transfer images to a computer or USB storage device for easy compilation and data gathering. The compact frame of 4.5″H x 3.25″W x 2.5″ ensures hassle-free carrying from one location to another in your property.